You never know who you might meet at a birthday party. Late last summer, right before Brimful launched, I attended a neighborhood birthday party. As chance would have it, I sat down to eat next to Brooklynite Ben Pinder* and his family, who were in town visiting family. The launch of the new website came up, which led to talk of baby toys and nursery decor. And that led to Ben sharing about the animal silhouettes he had painted for his oldest daughter when she was an infant. 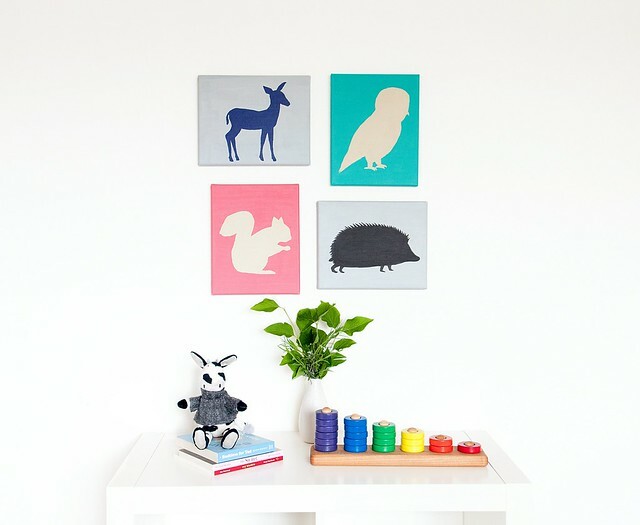 Months of collaborative emails later, Kari and I are so thrilled to add four woodland silhouettes by Ben in the shop. Purchased individually or as a set, these silhouettes are sure to fascinate and brighten any baby's room. Ben shared with us that "the first incarnation of these paintings were done for my newborn baby. Each one is painted by hand, so it is individually unique with visible brush strokes and attention to detail. The simple, contrasting shapes and colors are easy for newborns to focus on and helps develop their vision." Kari's personal favorite is the Hedgehog...and I'm rather drawn to the Deer. But then the Owl and Squirrel are pretty fabulous too! As always, these new shop products were chosen with careful thought and love for all babies...we want the best for our customers! I'll be back next week with a special Mother's Day post. *Ben Pinder studied art at the Pratt Institute in Brooklyn, NY where he works and lives with his wife and two daughters. He currently spends his time drawing, painting, building speakers, and making books in his tiny kitchen.